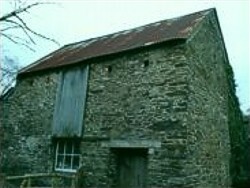 The Old Barn, near Duloe and Sandplace in Cornwall. Somewhere, hidden among the thick woods of the Looe Valley, an old barn waits to be converted to a holiday home (yes please! ), or pulled down and forgotten. 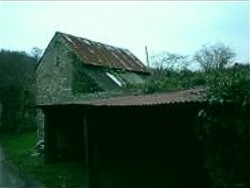 At present, the barn can be viewed by following Stocks Lane to it's bottom near Causeland Station. As a location, the barn proved to be very useful when it came to designing Barrow Hill's 'Owl Barn'. An old, crumbling farm building was needed to inspire and provide details. As you can see, from the photos below, the barn proved to be perfect. 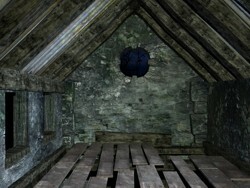 "The difficulty with The Owl Barn was that it was one of the 'test areas', which were initially designed to provide a practice ground for both the artist (Matt) and the 3D rendering software. Would both Matt, and the application, be able to create realistic 3D locations that can be viewed both up-close (like in the game) and at a distance, (like the screen captures above). 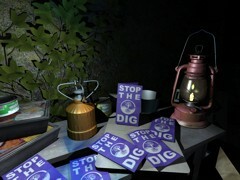 Thankfully, with a little virtual gardening and aging, the location came together very quickly, and was featured in the very first screenshot to be made public. 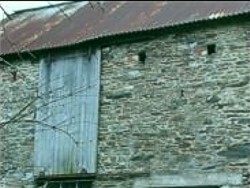 Left: The Owl Barn awaits its props and lighting; A cgi location waiting to come to life. Middle: A flask of hot tea? A camping stove? A rucksack? 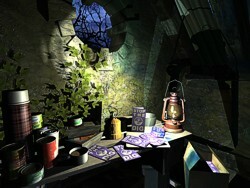 Right: A few scattered leaflets expose who's been hiding in the barn.